This brand new Strength Power Lifting Rack is inspired by traditional free weight exercising and fused with today's body weight and resistance training trends.This is an all inclusive choice for those who desire the safety and functionality of a lifting cage while incorporating additional features that allow the unit to be used as a body weight station or as a resistance training tool. Power Rack is loaded with comfort and safety features. The main frame is constructed from steel. All tube seams are welded to provide additional strength and stability. 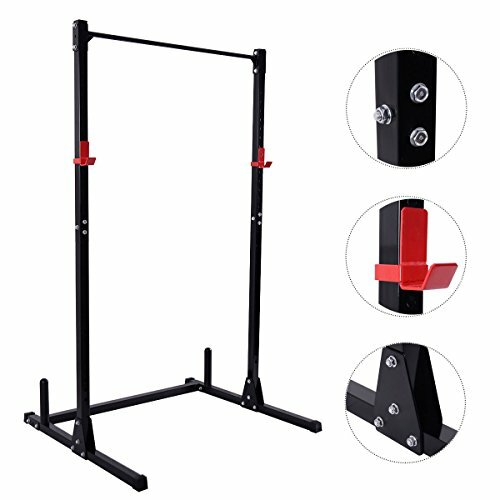 The overhead workout station is constructed from high grade tubular steel which is fully welded to mounting plates with mini gussets for extra reinforced support. All open frame ends are capped for safety and to prevent inner oxidation. All steel components of this half cage are powder coated and sealed. Don't hesitate to buy it!